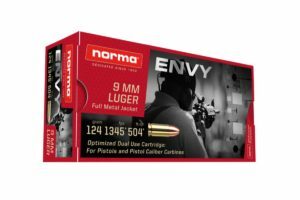 Norma has announced the introduction of their latest line of ammo, dubbed ENVY. The new ammunition, currently available only in 9x19mm, is designed to bring out the maximum accuracy and performance from PCCs, which continue to grow as one of the latest trends in the modern sporting rifle and tactical platforms. The halls of SHOT Show 2019 are filled with an ever growing crop of pistol caliber carbines, AR and AK pistols, and SBRs. Several of the new offerings really caught our attention at SHOT Show Range Day and on the show floor itself, so stay tuned to our show coverage for more information about our favorite new firearms from this category. As the already-high popularity of PCCs has surged in the past few years, so has the need for an improved target load that can bring out the best results for both training and competition. Norma is addressing this need with the ENVY line. With a more precise, uniform bullet design and improved tolerance ranges across production, Norma believes that ENVY is about to set a new standard of accuracy and performance from PCCs. Norma ENVY 9mm features a 124gr FMJ projectile with a muzzle velocity of 1345 fps. The MSRP for a 50-round box is $13.